Dr. Kumar Lal acquired his F.Sc from Govt. Degree College T.M.K, Pakistan. He later obtained his Bachelor of Medicine & Surgery from Liaquat University of Medical and Health Sciences Hyderabad (Jamshoro), Pakistan. 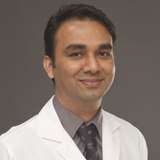 Dr. Kumar Lal has over 14 years of experience in different departments of Internal medicine. He started his professional career as House Resident at the LUMHS, Jamshoro Department of Medicine & Surgery. After completing House Residency, he Started his FCPS General Medicine fellowship training in College of Physicians & Surgeons, Pakistan and worked there for 6 years. Dr. Kumar is also associated with Royal college of Physician UK (MRCPII). He has worked in many Government and private hospital in Pakistan in his career as CMO/RMO, including, Liaquat Medical Hospital, Hafez Memorial hospital, and Mohammad Medical Center. Before Joining NMC Royal Hospital, he worked in Al Noor Hospital, Abu Dhabi, UAE for 2 years. Dr. Kumar Lal has special interest in Rheumatology, Diabetes Mellitus, Hypertension and Community Health awareness. Dr. Kumar Lal is certified in WHO collaborated Communication Skills, Research Methodology and has a research work on Pattern of Lipid Profile in DM-II, Pattern of Lipid Profile in patient on Hemodialysis, Clinical Pattern of Bronchial Carcinoma, Pulmonary Tuberculosis, that is published in JLUMHS, Medical Channel, Saudi Journal of Kidney Diseases and Transplantation. He can converse with his patient in Urdu, Hindi, Sindhi, Punjabi and English.